According to a new study, plugging into renewable energy sources outweighs the short driving ranges or cost for consumers planning to purchase electric vehicles. 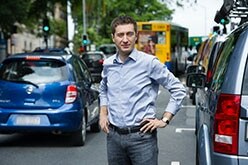 Dr Kenan Degirmenci, QUT Postdoctoral Research Fellow from QUT Business School, said environmental performance - or being green - was more significant than range confidence for electric vehicle consumers or price. High purchase costs and short driving ranges have been considered to be the main factors which impede people’s decision to buy electric vehicles. Since electricity needs to be produced from renewable energy sources for electric vehicles to be a true green alternative, the environmental performance has also been presumed to be a factor. In a newly published research titled ‘Consumer purchase intentions for electric vehicles: Is green more important than price and range?’ Dr Degirmenci discovered that environmental performance was actually an even stronger predictor of purchase intention over range confidence and price. The research was based on interviews with 40 consumers and a survey with 167 people who took part in test drives with plug-in battery electric vehicles in Germany. Dr Degirmenci said when analyzing greenhouse gas emissions, it was imperative to bear in mind the difference between on-road emissions only considering the fuel used, and well-to-wheel emissions including all emissions connected to fuel production, distribution, processing, and use. For example, a petrol-driven vehicle produces 119 g CO2-e/km, of which most are on-road emissions. In comparison, an electric vehicle produces zero on-road emissions. However, if electricity is generated from coal to charge an electric vehicle it produces 139g CO2-e/km well-to-wheel emissions, compared with only 9 g CO2-e/km well-to-wheel emissions with electricity from renewable energy sources. Dr Degirmenci stated the research findings were applicable to Australia because the transport industry accounted for 16% of the country’s greenhouse gas emissions, and 85 % of these were produced by road transport. “In this regard, a transition from conventional combustion vehicles to electric vehicles has the potential to reduce Australia’s greenhouse gas emissions substantially, if that electricity is produced from renewable energy sources,” Dr Degirmenci said.